Romolo Acrylic Modern Bathtub 67"
Name: Romolo Acrylic Modern Bathtub 67" - NEW DESIGN! This stylish one piece acrylic modern bathtub comes fully equipped with an over flow, pop-up and drain while lending itself to incorporate the phenomenal shapes attributed to modern acrylic bathroom design without neglecting form and function into your bathroom home d?cor. 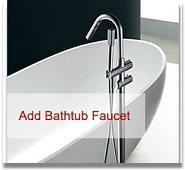 The amazing freestanding bathtub design will add unsurpassed trendy elements and elegant appeal to any bathroom d?cor. The Romolo freestanding bathtub provides an element of sophistication visually and to the touch with its soft smooth bowed edges, inviting you into a world of absolute harmony and relaxation.